Canada, a nation found in North America, has become a targeted destination for a number of migrants. The high quality of life and standard of living has made Canada as an alluring destination for working and living. People desiring for Canada Immigration is gradually increasing day by day. Canada has opened its doors for a number of overseas nationals through Canada immigration programs. Immigration to Canada is mostly seen under three categories such as family class migrants, independent migrants and refugees. Skilled professionals especially in IT fields are choosing Canada Immigration from India for better career opportunities. 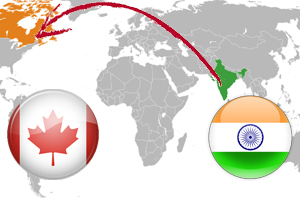 The government of Canada has introduced various skilled Canada Immigration programs to tempt people towards Immigration to Canada from India. Skilled employees and professionals who fulfill the required eligibility criteria can migrate to Canada to work and reside in on work and residence permit. Business immigration is also one of the pathways of Canada immigration. Investors, self-employed individuals and entrepreneurs who want to set up a business in Canada can migrate to Canada, under the business immigration category. Provincial nominees, is another method for Canada immigration, where an eligible individual is nominated by the state or territories of Canada provinces. Skilled employees who fulfill the required Canada immigration Requirements and eligibility criteria can also migrate to Canada on Quebec skilled worker program. People with recent Canadian work experience are eligible to work and settle in Canada under Canadian experience class. Sponsoring family members and dependents are some of the others ways of Canada immigration. These are the some of the Canada immigration pathways. Each way has its own Canada Visa Process and Canada immigration Benefits. However, Canada Immigration Processing Time will be varied for varies categories and it depends on the applicant profile.